Across the regions where we work there are between 3.5 and 4 million people who have been displaced as a result of armed conflict, persecution and environmental disasters, over half of whom are children. Refugees have fled their home country by choice or by force. 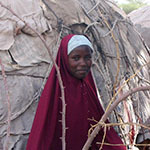 Internally Displaced Persons (IDPs) have sought refuge in another community within their home country. Returnees have returned to their home country by choice or after being evicted from their place of refuge. Only one third of displaced people find shelter in camps. The majority of people have to integrate into local communities, where they try to access already overstretched health, education and welfare services. Many displaced people face incredibly insecure living conditions and often have difficulty meeting their basic needs. When people are living without food, water, or shelter, education can sometimes be seen as a luxury. However, when we consider that the average length of time a person is displaced is 17 years, it is clear that we cannot afford to leave entire generations uneducated. Schools are often destroyed or used as shelters during conflict. If schools are still operational, fighting in local communities can mean the journey to school is a perilous one. Education is rarely funded during conlict because it is not seen as an essential service. Lack of education beyond primary school in camps leaves whole generations of displaced youth uneducated and unable to support themselves post-conflict. Over-stretched local education systems receive no assistance and are not able to accommodate displaced children. Children in displaced families often need to look after younger siblings or help support their family. Displaced people are often seen as outsiders and face stigma and discrimination when accessing education. People displaced to foreign countries face significant language barriers in accessing employment or education. Certificates of educational achievement are often lost or not recognised. Parents fear for the safety of children attending schools in unfamiliar settings, particularly girls. Returnees often face challenges of reintegration even when they return with essential skills. Education cannot be put on hold when people become displaced. Failing to prioritise education can leave whole generations disadvantaged and unable to contribute to their country’s recovery. The people in the communities where we work understand this reality. This is why their number one priority is education. 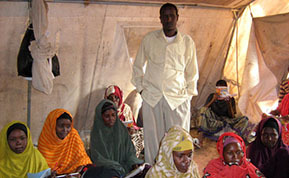 AET provides education to the displaced people in Somalia and South Sudan, including those who are unable to access the shelter and services provided within camps. We are working to meet this need and make sure that education can continue for displaced people. We deliver literacy, numeracy, life skills and vocational training to displaced people both inside and outside camps. We provide recognised qualifications so people can progress to further education, training and employment. We help displaced people and returnees integrate into their new communities. We provide local language training for refugees, IDPs and returnees. We continue to support education systems outside camps by training teachers, providing learning resources and supporting girls’ education. Education is a possession that will never have to be left behind. Help us provide it. Famine or conflict should not stop people from accessing education. Even when communities are displaced, they want the chance to continue education and gain the skills and knowledge they need to help rebuild their lives. Help education continue for displaced communities.